I came across this recipe on Vani's blog and decided to put the apples I had to good use. This is a simple, quick and tasty gojju that goes really well with rice. Add the chopped apples along with sambar powder. Mix well. Cover and cook till the apples are all soft and mushy, 7-8 minutes. Add the tamarind extract and the jaggery along with a cup of water and bring to a boil. Turn down the heat to medium and add the rice flour dissolved in water. Cook for another 2-3 minutes till the gojju thickens. Thank you for sharing your mother’s recipe, Vani! Here’s another gojju, one with spring onions and tomatoes, from my archives. 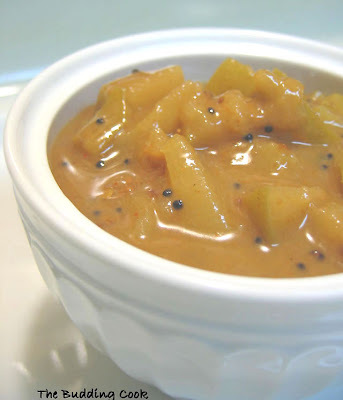 I love fruit-based curries/gravies like this apple gojju. This pineapple pulissery is another one of my favorites that my mother makes so well. Apple was laways had ina dessert form or as it is..never with spices..something new to me..
Apple gojju is again a new dish, and it looks thoroughly tangy and tempting! Apple gojju looks great so is it very sweet or more tangy and spicy? what does gojjumean? havent heard of it before. but it looks yummy. i can imagine the sweet and tartness of the apples, along with the other ingredients. it looks like a chutney to me. Rajitha- I know! I feel the same way. :( The "blogger in draft" feature is so cool! Sunshinemom- I'm glad I came across Vani's reipe. It's pretty good and can be made so quickly! Oh that's good to know.. A & I would prefer the tangy and spicy to very sweet curries too.